Designed by Yanone in 2010. 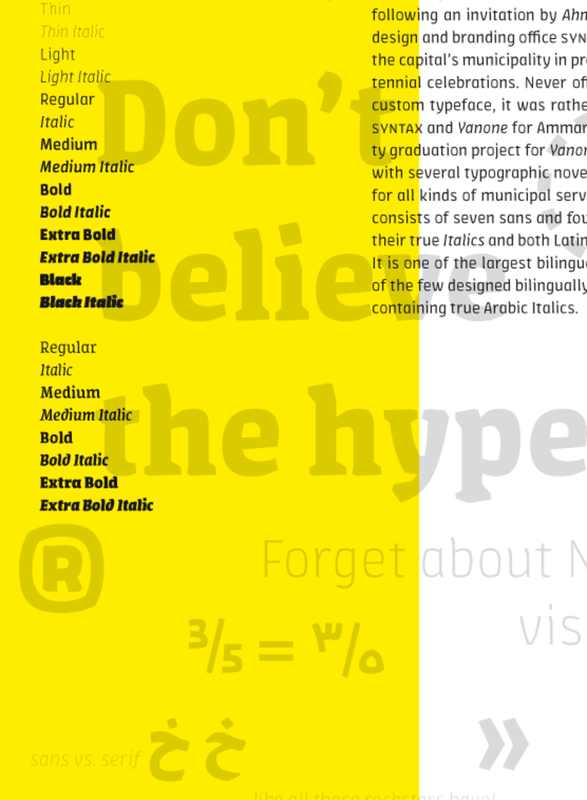 Published by FontFont as part of the FF Amman Super Family. FF Amman Serif supports up to 85 different languages such as Urdu, Arabic, Spanish, English, Portuguese, Persian, German, French, Turkish, Italian, Polish, Kurdish (Latin), Azerbaijani (Latin), Romanian, Dutch, Hungarian, Kazakh (Latin), Serbian (Latin), Czech, Swedish, Belarusian (Latin), Croatian, Slovak, Finnish, Danish, Lithuanian, Latvian, Slovenian, Irish, Estonian, Basque, Luxembourgian, and Icelandic in Latin, Arabic, and other scripts. 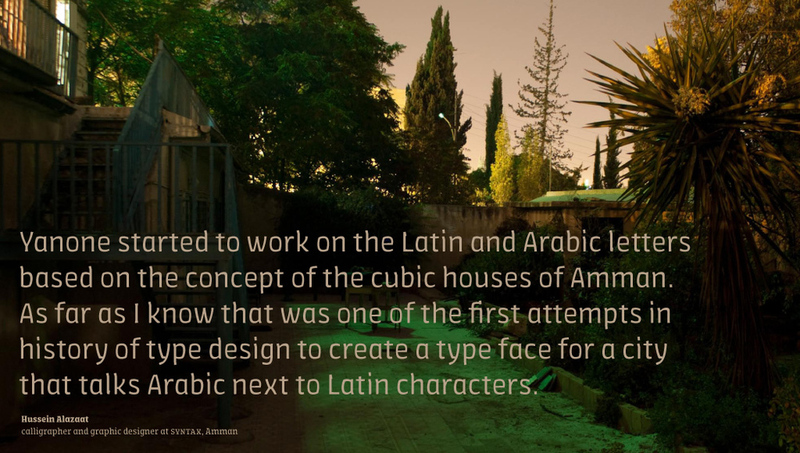 FF Amman was designed in both Latin and Arabic and is one of the very few bi-script families where both the Arabic and the Latin characters were concurrently drawn from scratch by the same designer. It’s also the first typeface of its kind to contain “true Arabic italics,” instead of the much more common oblique versions often paired with the Arabic script. The unconventional family includes seven sans serif and four serif weights, each complete with italics, and full Latin and Arabic character sets. Jan Gerner, alias Yanone, developed the family as part of his graduation project at the Bauhaus University in Weimar. In late 2008, Yanone traveled to Amman, the capital of Jordan, following an invitation from Ahmad Humeid from SYNTAX, a design and branding firm local to the city. Together they planned a city rebranding project in preparation for Amman’s centennial celebration. Though not officially commissioned as a custom typeface, the design was something of a birthday present from SYNTAX and Yanone to Amman. The result was widely adopted for use by various municipal services in Amman itself. All-in-all, FF Amman became the perfect graduation project for Yanone.